Roundtables are a monthly gathering of pack, troop, team, crew, and district leaders. Get the latest information on district and council events, training opportunities, BSA policies and learn about great available resources. 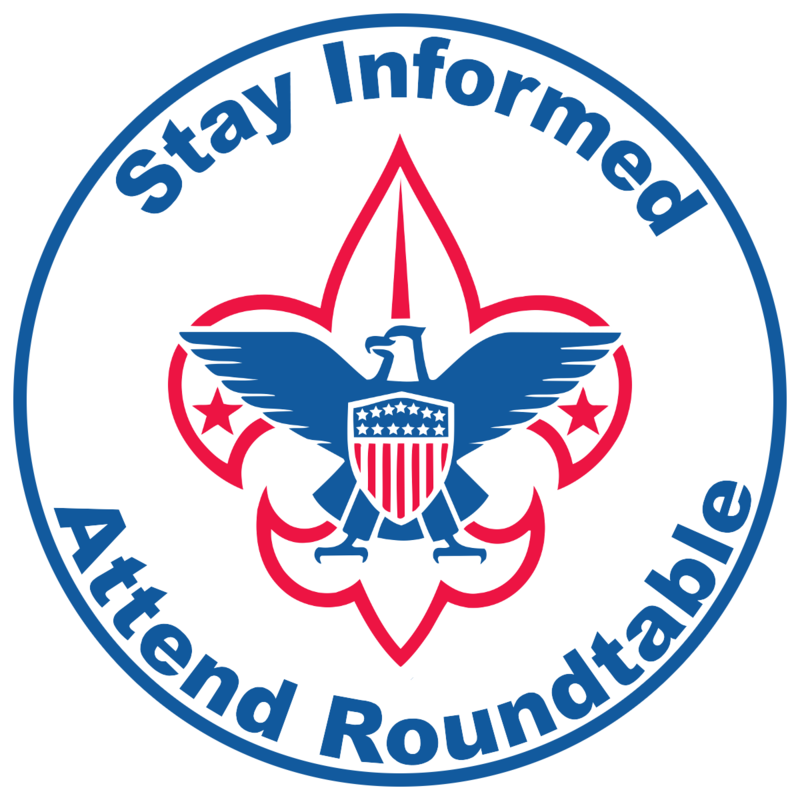 Roundtable is an opportunity to share experiences and enjoy fun and fellowship with other Scouting leaders. The roundtable commissioner and staff demonstrate elements of a model meeting that leaders may use as a pattern for their own meetings. As a result of the roundtable experience, unit leaders will be inspired, motivated, and prepared to provide a stronger program for Scouts. To help motivate unit leaders and refresh their morale, enthusiasm, inspiration and vision. To provide unit leaders with relevant skills, techniques, ideas, information and know-how to make their unit operation successful. This instruction builds strong and exciting scouting programs. To provide resources to help unit leaders in their roles. Respect the time given by each Scout or Scouter that is attending-- it can never be replaced. All Adult Leaders who hold any position within their units are invited to attend each month. Come and share your knowledge, skills and resources for the benefit of all your leaders and youth in your local district. For more information on your District's Roundtable, contact your local Unit Commissioner or a member of the District leadership. You may also click on Districts and then select your district to see when and where your Roundtable is being held. A new curriculum, based on BSA's Program Features and an LDS version of the NYLT syllabus, is now available. These lessons enable leaders to follow the Young Men general presidency's directive regarding youth: Be with Them, Connect Them with Heaven, and Let Them Lead. Download a slide presentation about these directives and using Scouting resources to help with your young men activities here. Download the Roundtable Guide Introduction and all monthly agendas as a single PDF here. These agendas reference the LDS NYLT curriculum, which is a series of leadership skills to teach youth. These skills are best taught in order, so for the skill instruction portion of Roundtable, teach the next skill in the list.